The anatomic pathology market worldwide is experiencing stiff competition because of the presence of numerous large companies and a handful of regional players challenging their might in the local pockets. In order to thrive in such a cutthroat environment, players are seen ramping up expenditure in research and development of disease indications. 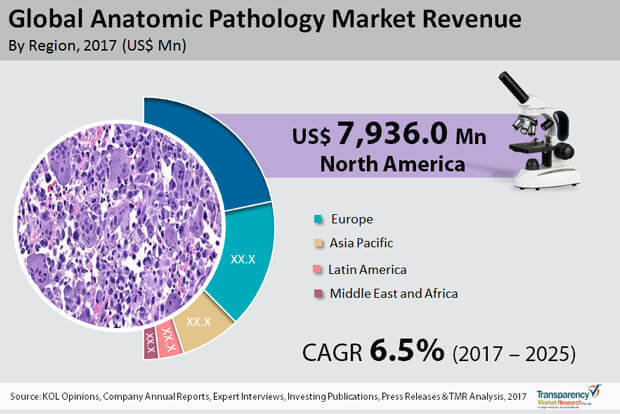 Some of the key companies operating in the global anatomic pathology market are Abbott Laboratories, Laboratory Corporation of America Holdings, Danaher Corporation, Thermo Fisher Scientific Inc., Quest Diagnostics Incorporated, NeoGenomics Laboratories Inc., Agilent Technologies Inc., Sakura Finetek USA Inc., and F. Hoffmann-La Roche Ltd. The market for anatomic pathology worldwide will likely rise at a steady pace of 6.5% during the period from 2017 to 2025, predicts a report by Transparency Market Research. At this pace, the market is projected to clock a value of US$30,314.5 mn by 2025-end from US$17,318.0 mn in 2016. Depending upon products and services, the global market for anatomic pathology can be segmented into consumables, instruments, and services. The segment of instruments can be divided further into tissue processor, microtomes, slide strainer, etc. The services segment, among them, leads the market at present on account of the rising instances of critical illnesses needing urgent medical attention. In 2016, it accounted for a significant 45.9% share in the market. Geographically, North America holds is a leading position in the market and in 2016 held a substantial 40.0% share in it. The region’s dominance is mainly because of a large pool of elderly who are highly susceptible to various diseases and the growing occurrence of chronic diseases. A superior healthcare infrastructure and affordable yet quality treatment options too are having a positive impact on the market. Anatomic pathology serves to uncover abnormalities which in turn enables detection of various diseases and carry out treatments. Therefore, anatomic pathology is finding rising application in uncovering and managing different kinds of cancers and tumors. Alarming increase in the number of such deadly medical conditions is one of the main factors boosting the market for anatomic pathology. Apart from the increasing prevalence of such chronic conditions, rising spends on healthcare, a burgeoning elderly population, and rising use and effectiveness of biomarkers for diagnosis of diseases is also bolstering the market for anatomic pathology. Further, continued progress on the technological front, leading to more sophisticated anatomic pathology methods has benefitted the demand in the market as well. This is particularly true of developed countries in the world which typically earmark considerable amounts on research and development in the domain of disease diagnosis and treatment. Not to be left behind, developing countries too are adding to the demand in the market on the back of initiatives by governments to generate awareness about new cutting-edge technologies. Currently, the end-use segment of diagnostic center is generating maximum demand in the market because of their low cost. Going forward, the segment will likely progress at an impressive pace due to the extensive usage of anatomic assays and easy availability of novel molecular testing instruments and anatomic pathology testing kits which help to detect cancer at reduced costs. Hospitals and research organizations are other key end-use segments driving demand in the market for anatomic pathology.